Some friends of mine recently had a big adventure trying to walk along the Snowy River – read about it here. I got roped in, kicking and screaming (read: I volunteered) to make them some more interesting light-weight camping food for hiking than just 2 minute noodles and instant porridge. 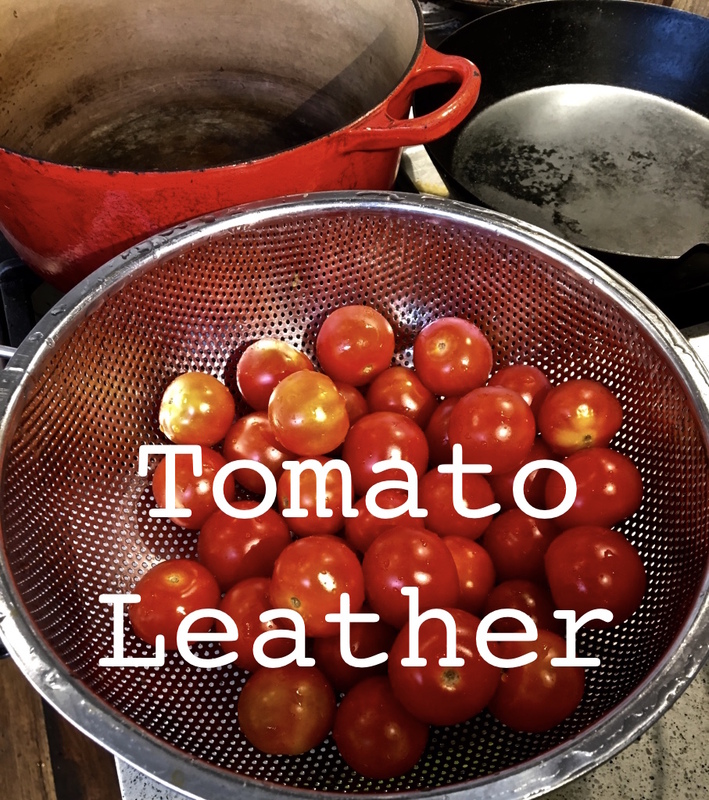 there were some good things (chocolate semolina pudding), there were some okay things (cheesy mushroom semolina), but the clear, stand-out, everybody-loved-it item was this tomato leather. I’ve been promising to put this up for about 2 months now, so here it is. It should go without saying (but I’m going to say it anyway) that you should take this in whatever direction your heart desires, really the only ingredient that has to stay is the tomatoes (and maybe the apples), everything else is negotiable. Next time I do it I think I’ll go for heaps of garlic, chilli, turmeric and mustard seeds. Obviously all the basil would also be great. This is great as just a snack, but you can cover it in hot water and drink it as a soup, or make it up into a pasta sauce. 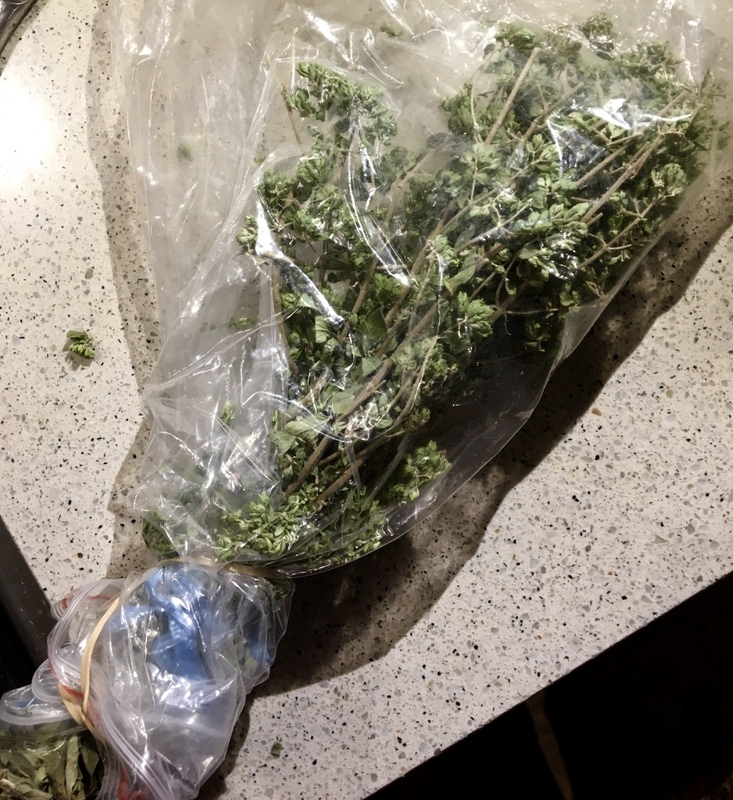 This dried oregano you can get in a bunch of different greengrocers around where I live (I get mine from La Manna Fresh), I’m not sure how easy it is to find in other places around town though. If you can’t get it I’d use fresh or choose another herb rather than the supermarket stuff that just tastes like bitter dust. 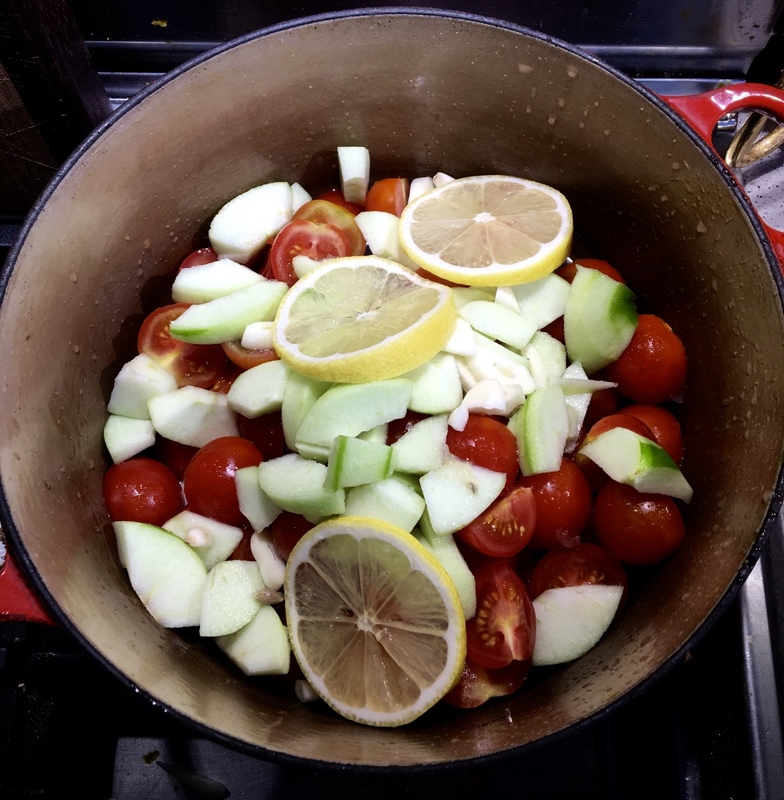 Put the tomatoes in a large, non-reactive pot with the apple, garlic, lemon juice, lemon slices and oregano. Bring to a boil then reduce the heat. 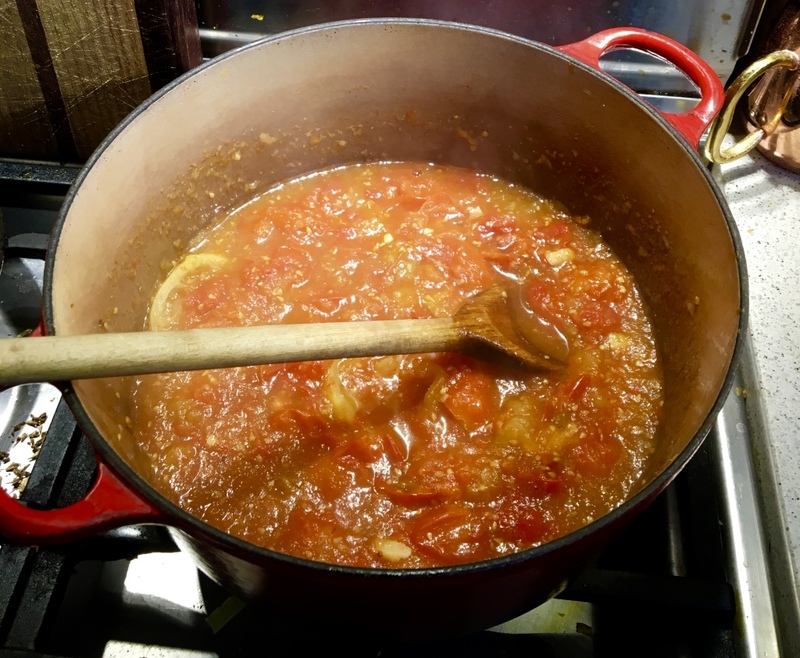 Let simmer until the tomatoes are cooked and the apple is soft. Blend, either in a traditional blender or using an immersion blender, until it is as smooth as you can get it. Strain the liquid through a strainer to get any seeds, bits unblended skin, and rouge herb out. Push as much of the solids through with the back of a spoon as you can. Put the strained mixture back in the pot and add the salt, pepper and sugar. Taste, and adjust the seasoning to your taste – you might even want to add a little more lemon juice. Be careful with the sweet to sour ratio though, otherwise you’ll end up with something that tastes too close to tomato sauce (ketchup, for any American readers). Unless you want that, in which case have at it. Put the pot back on a low heat and cook down until the liquid is pretty thick – reduced by say ⅓–½. Stir frequently so it doesn’t catch on the bottom of the pot. If you’ve got a splatter screen/guard this a good time to use it. If you have a food dehydrator use that to make the leather following the manufacturer’s instructions. If not, you can do it very easily in the oven. Find a large flat tray that has at least 2cm of lip around the edge – a pyrex oven tray or something non-stick would be ideal. You want to choose a tray size that will mean that your puree will be about ½cm deep when spread out. If your tray is non-stick just pour the liquid straight in and tap it on the bench to smooth it out across the tray. For other trays either line them with baking paper or a silicone or fibreglass mat, then follow the same process to smooth out the tomato. It’s easier to line a tray with paper if you oil the tray first, that way the paper will stick in place and not shuffle around when you pour your puree on it. Put in the oven at its lowest temperature for at least six hours, but probably longer (easiest to do overnight). You might get a few cracks in the middle of the leather as it dries out if the edges stick to the tray a little, it won’t change the flavour and it will still turn into leather. It’s done when the leather is not tacky to the touch, is cohesive and strong, and sort of translucent. Let cool and cut into desired size/shapes. Wrap in greaseproof or baking paper. I have a question! Say you didn’t immediately scarf the lot, how long would this last for? Apparently at least 7 months if stored somewhere dry and away from light. It will never last that long though because it will all be scarfed immediately. Previous Previous post: Grape pickle. All the little bits. Next Next post: Stew. Casserole? A riff on Boeuf Bourguignon.